Sunday 8th October 2017 and Avril and I had just completed a WeBS (Wetland Bird Survey) Count for the British Trust for Ornithology around the Oldany estuary and we were heading back out the dornie track. 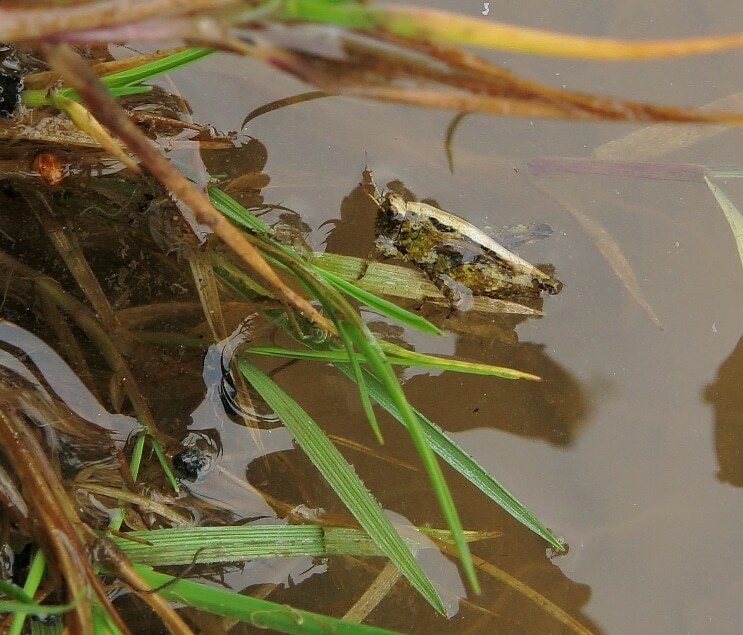 To say it had been raining lately was an understatement; anyway the ruts were full of water and suddenly a metallic flash caught my eye in one of the puddles. 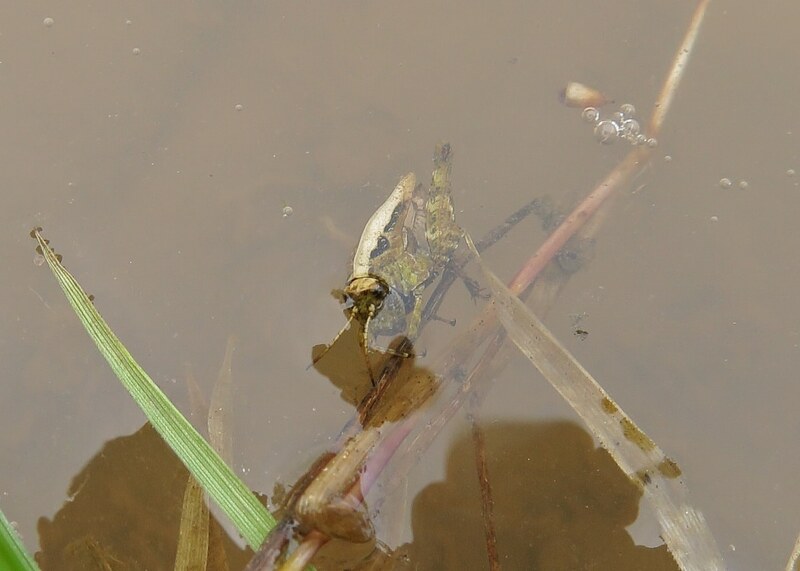 First thought was that it was a beetle, or similar, moving in the water with a short length of yellowed grass stuck to its back. Avril, whose eyes are better than mine at close ups, realised that it was actually part of an insect which was reflecting the light. Sure enough it was a grasshopper type insect happily ‘swimming’ about. 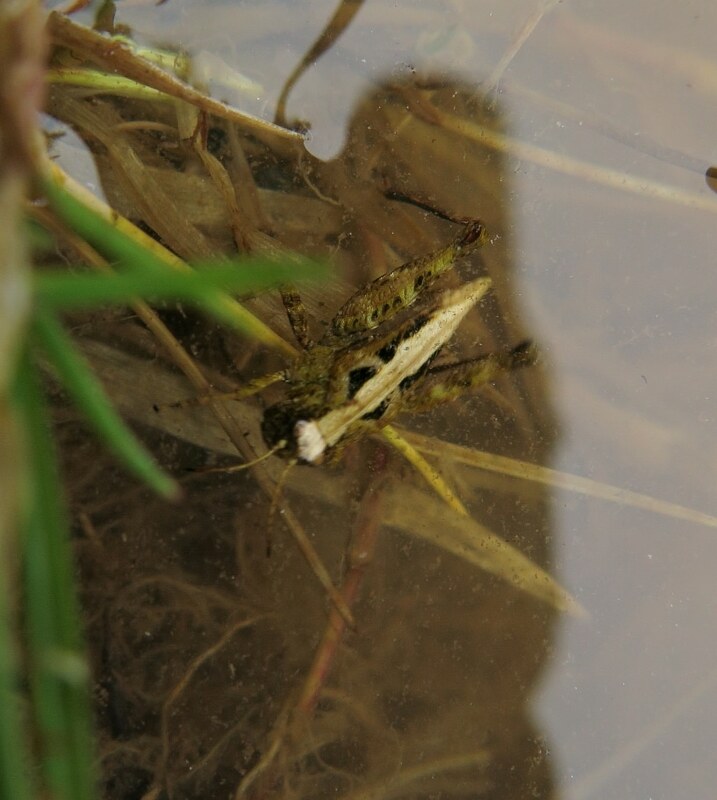 Never having seen a grasshopper in water we were a bit confused and, of course, took a few photographs. After speaking with and sending some photographs to Ian Evans and Inverness based entomologist Stephen Moran it turns out to have been the Common Groundhopper Tetrix undulata. Stephen actually commented that he remembered reading they are pretty competent swimmers and he had seen this himself on a couple of occasions. This species of groundhopper is recognisable by the keel on the pronotum which can be clearly seen in the attached photos. On checking the National Biodiversity Network it transpires there are only five other records of this, not easily seen, species in Assynt ranging from 1940 to 2014; two from 1983 had in fact been submitted by Stephen.